Every five years the Aero Warriors gather to celebrate and commemorate two of the most unusual automobiles ever produced and sold by United States auto makers. We welcome all models of autos that represent the 1970 Nascar Era. Aero automobiles include: 1969 Dodge Charger 500, 1969 Dodge Daytona, 1970 Plymouth Superbird, Ford Talladega and Mercury Spoiler II. Once again Wellborn Musclecar Museum is honored to have been chosen as the host of such a great reunion. Tim and Pam Wellborn have worked tirelessly to bring together a legendary group of Aero Warrior VIPs, owners and enthusiast. This is going to be another great Aero Reunion this year as we celebrate the 50th anniversary of the Aero Warrior and the 50th Anniversary of the Talladega Super Speedway!! We will all gather at the McDonough, GA. Call early and secure your hotel. Primary Host hotel: for Wednesday night Oct 9th. We kick-off this spectacular weekend at the Atlanta Motor Speedway! You be all smiles with a little track time. 7:30am Briefing at the Track. 8:00an - 9:30am is time to do some celebratory laps on the Speedway. We have secured trailer parking in the nearby Winn Dixie parking lot on Hwy 280 in Alexander City and across the street next to River Bank and Trust. We will post a google map soon. Tim and Pam Wellborn welcomes everyone to their home and personal garages. This will be a great day for everyone to meet, greet and mingle among the cars. NO TRAILERS PLEASE. 10:00am: Official check-in at Russwood, the home of Tim and Pam Wellborn. 10:00am - 7:00pm: Display of cars on the lawn at Russwood. 12:00 noon: Lunch will be provided. Bring your chairs and coolers to enjoy the tailgate. 1:30pm and 2:30pm: Inside tour of Russwood. Meet on the front porch. 6:00pm: Cajun/Creole Seafood Boil. Presented by Paul and Cindy Reynolds and the New Orleans Mopar Club. 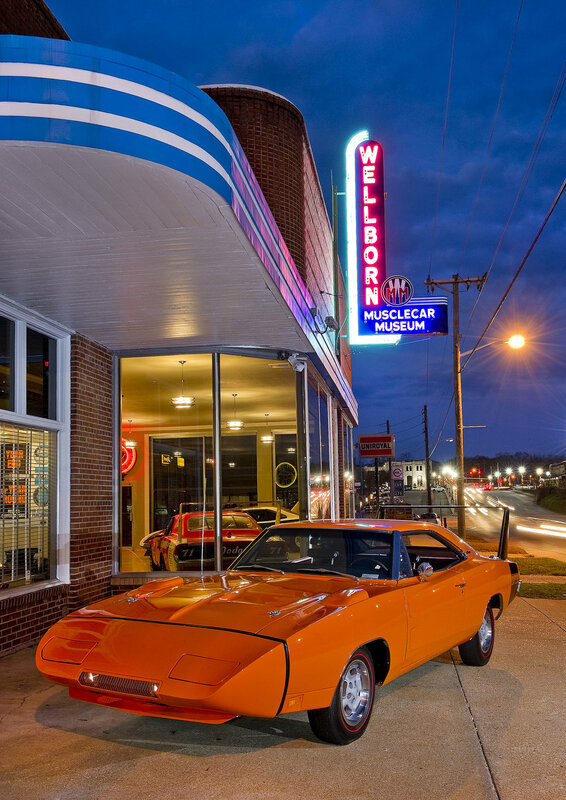 Saturday the fun continues as everyone is welcomed to the Wellborn Musclecar Museum. This is the day to mingle among some of the most legendary names in Aero Warrior history. So many stories, so little time. 10:00am - 12:00 noon. Arrive at the museum. 2:00pm: Introduction to some special VIPs at the Wellborn Museum. 6:00pm: Dinner at the Museum and a Silent Auction. If you have items you would like to donate to the museum for the silent auction please contact us! Dress for Dinner: It’s Halloween so lets have some fun. Dress to match the color of your car, as a celebrity or 1970’s style. Going to be a celebration worthy of the history books! Sunday revs things up in a big way. Everyone will convoy their cars from Alexander City to Talladega Super Speedway. This year is a special year for the Aero Warriors 5oth Anniversary and the Talladega Super Speedway’s 50th Anniversary! We will not be allowed on the track this year. This year the Speedway is unveiling a brand new 50 million dollar infield and we will be the first to be inside front and center. This will be a great honor for all Aero Warriors. Here is a note from the track. 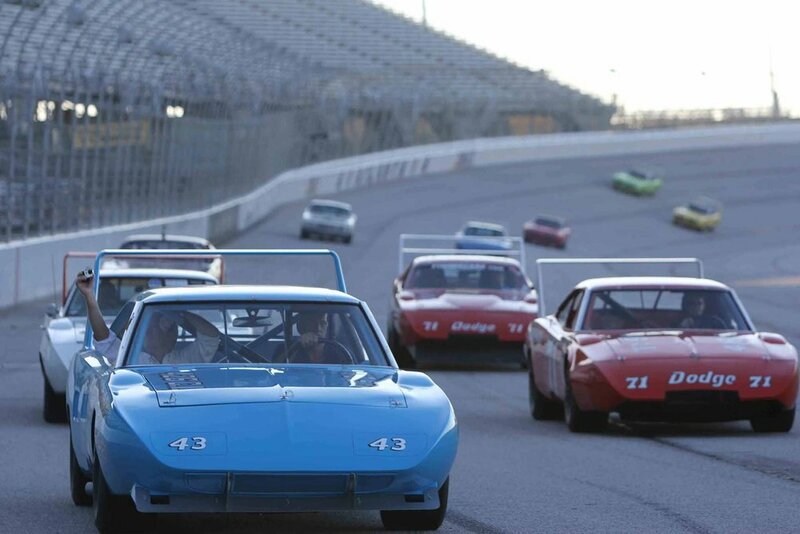 Be a part of Talladega Superspeedway’s 50th Anniversary October 13! Your historic car will be parked in the NASCAR Gander Outdoors Truck Series Garage and you can witness the Cup race just inside the track with an up-close look as the cars come out of Turn 4. In addition, you will be able to be a part of debut of the one-of-a-kind Talladega Garage Experience, the center point of the track’s “Transformation” Infield Project that will allow fans to be immersed into the sport of NASCAR and will feature “up-close” access, interactive attractions and enhanced amenities for fans. The TGE will feature an open-air club with garage viewing of the teams prepping the race cars, new Gatorade Victory Lane, Wi-Fi, social areas, etc. Your cars will be able to be viewed by fans from not only the stands, but also from those who have TGE passes. This garage is the original garage from which the aero cars made their debut. Indeed a special day awaits the Aero warriors. We will be receiving specific instructions about how we will enter into the new complex. When we have the directions we will immediately share with you. What is the criteria for submitting a vehicle? We welcome all models of autos that represent the 1970 Nascar Era. Aero automobiles include: 1969 Dodge Charger 500, 1969 Dodge Daytona, 1970 Plymouth Superbird, Ford Talladega and Mercury Spoiler II. Aero Warriors will receive priority. All other submissions will be considered if the show is not full. If you would like to have a vehicle considered, please observe the following steps. 1. Only 150 automobiles will be selected. The earlier you submit your automobile for consideration the better. Individuals that wait until the deadline will probably find the field has been set. 2. Submit two photos (one front and one side elevation). Due to the volume received, photos cannot be returned. 3. Include a brief history of the vehicle. 4. Your submission (photos and history) must be emailed August 3, 2019. What are Registration Fees for the Event? Once you have received acceptance into the event you will return to the webpage and enter a coded page with registration forms and payment. Registration for one car for both days is $220.00. This registration fee includes: One car in the show for two days, Admission to the museum for two people Thursday through Saturday, Two meal tickets for lunch Friday, Two meals tickets to Cook-out Friday night, Two meal tickets to Dinner at the museum Saturday night. Admission to the Talladega Super Speedway for Sunday is a special Aero Package. Your cost is $65 for one car and maximum of two people per car. Additional Talladega Tickets. $35 per person. Additional Admission to the museum is $10.00 each for each day. Use the form below to submit your vehicle registration. Register and Purchase Your Aero Tickets! Once you have received your acceptance letter you, use the links below to register and purchase your event tickets! These pages are password protected. Your password is on your acceptance letter. If you have question or need any help, please feel free to contact us. We look forward to seeing you in October! !